Morantz Ultrasonics specializes in building quality Ultrasonic Cleaning Systems that allow you to clean faster, more effectively and more efficiently than any other method. Morantz Ultrasonics are easy to use, safe for the environment and will allow you to quickly maximize your profit potential. With more than 80 years serving our customers (and almost 40 years experience developing Ultrasonics), Morantz Ultrasonics is the world leader in building Ultrasonic Cleaning Systems for the Window Blind Cleaning, Medical Cleaning, Electronics Cleaning, Parts Cleaning, Janitorial and Facilities Maintenance and Contents Restoration (Fire and Water Restoration, Mold Remediation and Disaster Recovery) industries. Now, with our third generation in place, Morantz Ultrasonics is moving boldly into the future. With new systems and services in development, we look forward to serving our customers for another 80 years (at least). To learn more about our history, please continue reading. To learn about the Morantz Team, Click Here. For over 45 years, long before Stan Morantz invented his first Ultrasonic Cleaning System, Herb and Evelyn Morantz ran a small drapery manufacturing shop in Philadelphia, Pennsylvania. Business was good and by the early 1960s, Herb and Evelyn were making draperies for many of Philadelphia’s top interior designers. By the late 60s, window blinds were becoming popular and Herb began manufacturing them as well. Unfortunately, there was a problem. People were having trouble cleaning their blinds. 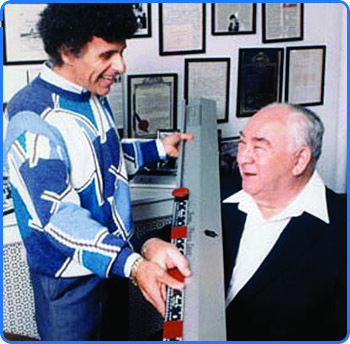 In order to satisfy his customers, Herb added blind cleaning to his services and quickly discovered what his customers already knew; cleaning window blinds by hand was difficult and time consuming. During this time, Herb and Evelyn’s son Stan joined the business. Stan was responsible for screen-printing custom designs on the draperies (something that was fashionable at the time). As business grew, Stan noticed that Herb and Evelyn were having trouble keeping up with orders because they were still making drapes the way they had when they first started their business decades before. Frustrated by watching his parents working so hard, Stan declared, “There’s got to be a better way.” Together, Stan and Herb took a hard look at how they were running their business and started to create tools that would make work easier. Their first invention, The Morantz Pleater Gauge™, literally revolutionized the industry by allowing people to pleat a drape in less than half the time of traditional methods. Inspired by their success with the The Pleater Gauge, Stan continued to innovate, ultimately earning an amazing 52 patents for drapery workroom tools and techniques. Ultimately, companies from JC Penny and Sears to small “mom and pop” shops throughout the world began using Stan and Herb’s tools, but there was still a problem; their window blind customers were still asking them how to clean their blinds. The “L’il Baby” Changes Everything, Again! Once again, Stan took a hard look at the business and realized that there was indeed a massive opportunity in cleaning window blinds; if only it could be done more efficiently. So Stan began experimenting, ultimately trying several dozen different methods including using the family dishwasher! Nothing worked. Then, Stan remembered something he had heard while serving in the Army during the Cuban Missile Crisis. Stan never told anyone what it was (“it’s Top Secret,” he said), but it involved something called “ultrasonics.” Within days, Stan designed the prototype for what ultimately became the world’s first Ultrasonic Window Blind Cleaning machine, The L’il Baby™. Since that day almost 40 years ago, Morantz Ultrasonics has been the leader in the development of Ultrasonic cleaning technology and Morantz Ultrasonic Cleaning Systems are being utilized throughout the world. Today, Morantz Ultrasonic Cleaning Systems are being used to clean everything from window blinds, golf clubs, light diffusers, wheelchairs, computers, electronics, to soot and smoke damaged items (with our Firesonics™ Systems) and much, much more. 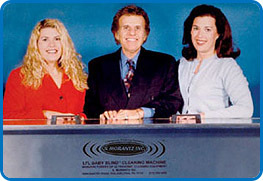 Heather, Stan and Lisa Morantz with the L’il Baby Blind Cleaner in 1997. Now celebrating over 80 years in business, Stan’s daughters, Lisa and Heather, are leading Morantz Ultrasonics into the twenty-first century. With Lisa now President of Morantz Ultrasonics and a growing international distribution network, the Morantz family continues to serve their customers by creating ground breaking products and providing world class customer service. At Morantz, our future is brighter than ever and we look forward to welcoming you to our family of clients. To learn more about Morantz Ultrasonics, call us at 215.969.0266.